I will definitely come back here for more deliciousness. The night before visiting Acme Cafe, I asked a bunch of foodies on Twitter for a comfortable couple’s brunch place in Vancouver. I got a variety of replies and for some reason, Acme Cafe stood out to me. I have heard really positive comments about Acme so Jacky and I decided to try it out. 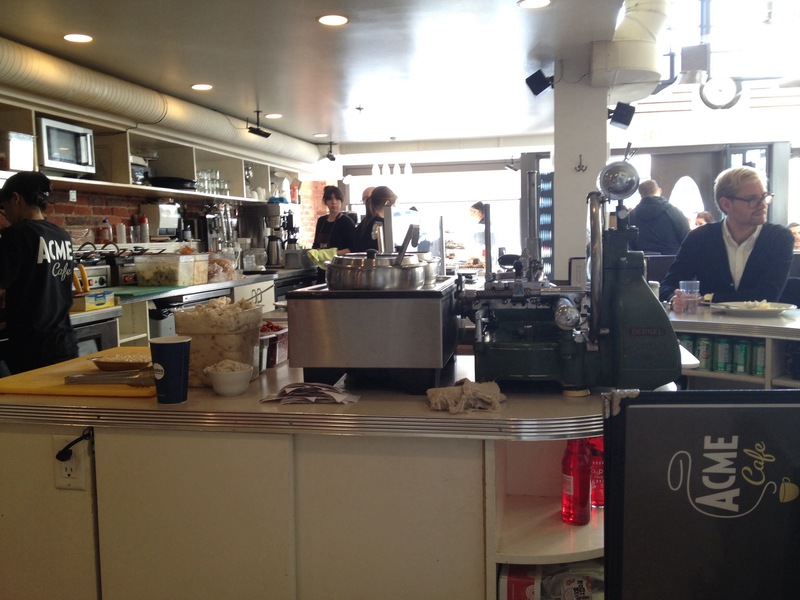 I usually would not go near East Hastings when it’s dark so on a sunny Friday morning, it was just great. Acme was spacious and the most interesting part of the restaurant was the U-shaped high table with a view of their open kitchen. Jacky and I sat at the tip of the U where we could see all the magic happen. I was very impressed with the fresh ingredients used and how fast everything was made. The girl making the sandwiches was working so hard! Well done! Before going to Acme, I also did quick research on their menu and the Shrimp Melt (CAD12.75) with soup was a must get for me. The deal was so worth it with a tomato, chicken, and creamy cheese soup. 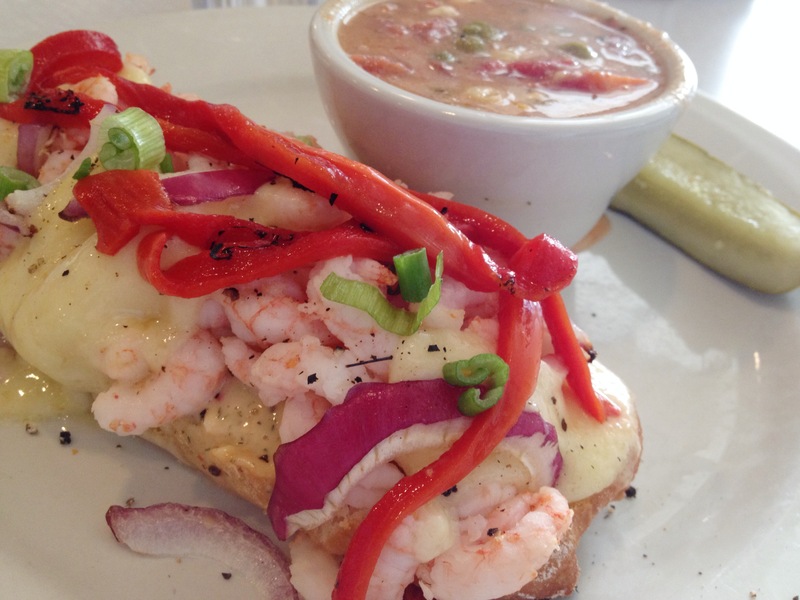 Placed on the toasted piece of ciabatta are roasted red peppers, melted Jack cheese, red onions, green onions and a very pleasing portion of shrimp. I highly recommend ordering this and I am definitely coming back for more. Jacky ordered the Meat Loaf Sandwich (CAD12.50) with Mac N Cheese for +2.00 since he was craving for some creamy cheesy mac. 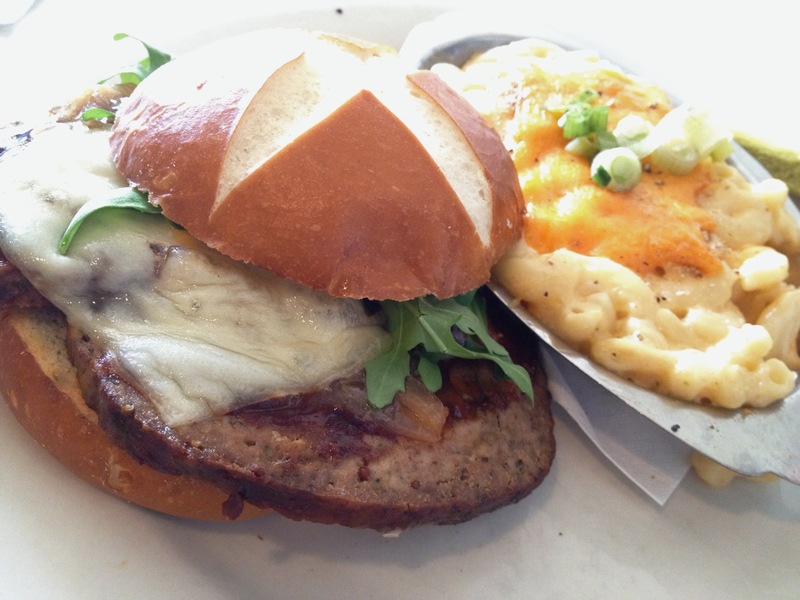 Stuffed inside the pretzel bun is Dijon mayo, melted Swiss cheese, arugula, caramelized onions and hot BBQ sauce drizzled on top of two pieces of meat loaf. This sandwich is definitely a man sandwich and personally I think it would be great for a hang over.